Happy Monday! I’m coming back from a pretty awesome weekend. It was relaxing and productive all at once. I’m all kinds of giddy to get out of town next weekend for my first wedding anniversary, so I’m hoping that this week flies by. We had a few friends over on Sunday to watch the NBA finals so Evan and I put out a delicious spread of ribs, chicken, corn on the cob and three bean salad but most delicious of all was the warm rhubarb crunch that capped our meal. A few years ago, Evan’s mom made him a cookbook filled with all of his favorite childhood recipe’s, including this recipe for rhubarb crunch. This tart and sweet dessert is the absolute best! Served with ice cream, you’ll think you’ve died and gone to heaven. Enjoy! In a saucepan, place all of the ingredients for the filling and cook over medium heat for 10-15 or until the mixture has cooked down and thickened. Meanwhile, in a large bowl, mix flour, oatmeal, brown sugar and melted butter. Place 1/2 crunch mixture into a 2-quart baking dish or several individual ramekins. Fill about 3/4 full with rhubarb filling and top evenly with remaining crunch topping. Bake on a cookie or baking sheet to catch overflow for 1 hour. Let rhubarb crunch cool for 10-15 minutes and serve with ice cream or fresh whipped cream. ← My Weekend Plans+Happy Friday! Thanks! I can’t wait to see your tart! Sounds wonderful, love the topping. Beautiful photo too. Thanks so much! If you love rhubarb (or even if you don’t) this recipe is an easy winner. BTW, I perused through your foodie blog….OMG! That is all. Talk about beautiful photo’s! Strawberries and rhubarb are definitely yummy together but going by the empty baking dish in the aftermath of our dessert binge, it seems the rhubarb alone can stand its ground. The cold ice cream with the warm rhubarb was unforgettable. Love using rhubarb in the fall! Great recipe! 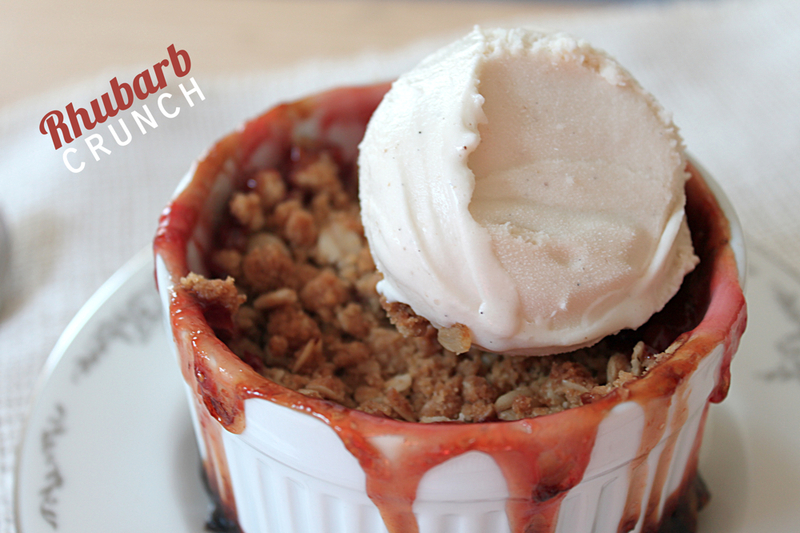 I can only find frozen rhubarb in the fall… it seems to only be around fresh in the Summer around here. Are you in the states? P.S. your food looks amazing! Thanks! It’s one of my favorite desserts and it’s so easy to throw together!